A cross-section of stakeholders participated in the workshop to ensure the acceptance and success of ecosystem accounting. Since Rwanda is faced with many competing land uses they will prioritize land, water and mineral accounts, as presented by Environmental Economist Claudine Uwera, WAVES-Rwanda National Coordinator. “Learning from each other is important for capacity building and institutionalization,” said Glenn-Marie Lange, WAVES Program Manager. 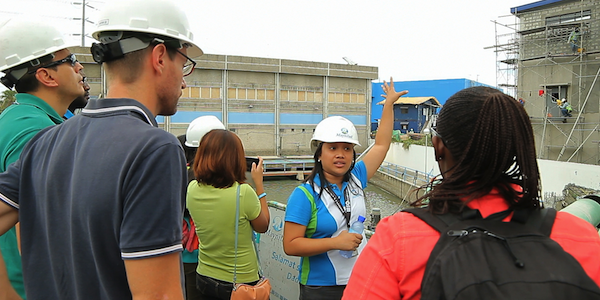 At the Putatan Water Treatment Plant participants walked through the water filtration process. 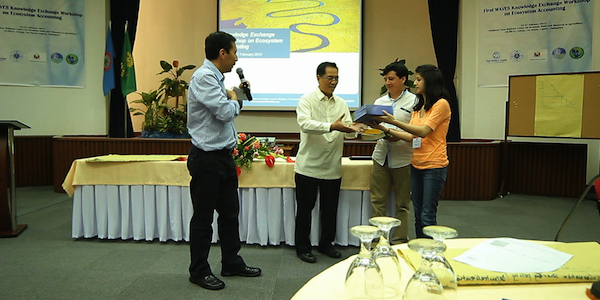 Certificates of completion were presented by WAVES Program Manager Glenn-Marie Lange and the Interim Deputy National Statistician Romeo Recide of the Philippine Statistics Authority. The countries that were in attendance were low to middle-income countries where there are competing demands on natural resource use as their economies grow. Working together to develop work plans for ecosystem accounts. 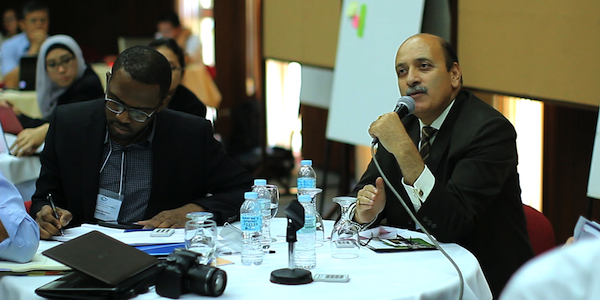 The first day of the workshop focused on ecosystem accounting essentials and policy use of accounts. 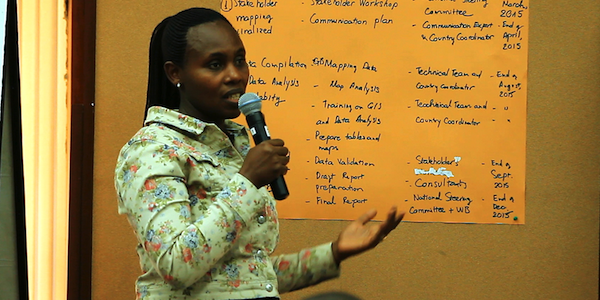 On the last day of the workshop, participants presented their work plan. 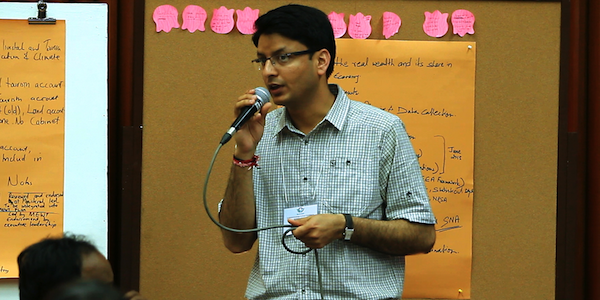 Om Prakesh from India presents the work plan on forest accounts in Himachal Pradesh and their role in the state economy. 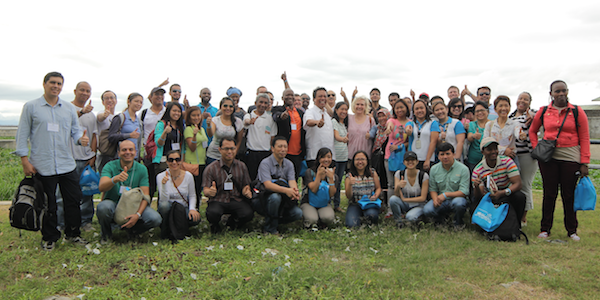 Participants from the Knowledge Exchange Workshop-over 100 delegates from nine countries-gather for a group shot with the Laguna Lake Basin in the background. 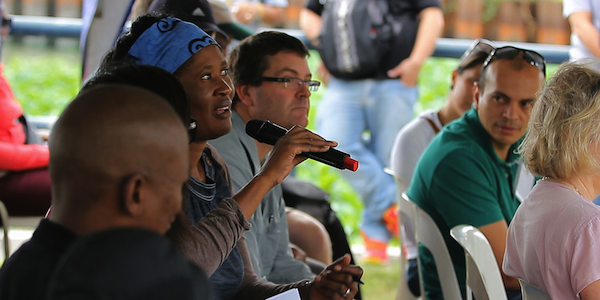 WAVES-Botswana Country Coordinator Portia Segomelo asks a question during the field trip. Héctor Tuy, a researcher at Guatemala's Institute of Agriculture, Natural Resources and Environment, presented Romeo Recide with publications of Guatemala's environmental accounts. 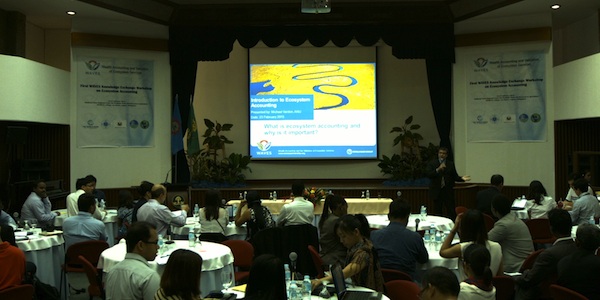 More than 100 delegates from nine countries gathered in the Philippines for the first WAVES (Wealth Accounting and the Valuation of Ecosystem Services) Knowledge Exchange Workshop on Ecosystem Accounting February 23-27, 2015. The participants at the five-day workshop (agenda and links to presentations) aimed to learn, brainstorm, collaborate and share best practices and experiences on ecosystem accounting. Ecosystems range from the relatively undisturbed areas, like natural forests, to systems intensively managed and modified by humans, such as agriculture land and urban areas. Ecosystem accounting provides a framework to capture the inputs of ecosystems to human well-being, as well as a way to value all of contributions of ecosystems to the economy. As more countries join the WAVES Global Partnership, there is an increasing interest in ecosystem accounting. However, since there is a wide range of approaches to ecosystem accounting, it is critical to build a common understanding and share lessons learned from those countries piloting ecosystem accounting, most notably the Philippines, India, Guatemala and Australia. “This is quite a historic event. 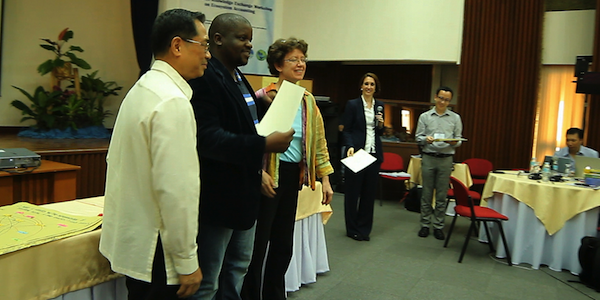 This is the first time that there will be this kind of systematic training by and for developing countries on ecosystem accounting,” said WAVES Program Manager Glenn-Marie Lange. “Capacity building is a very important part of WAVES. 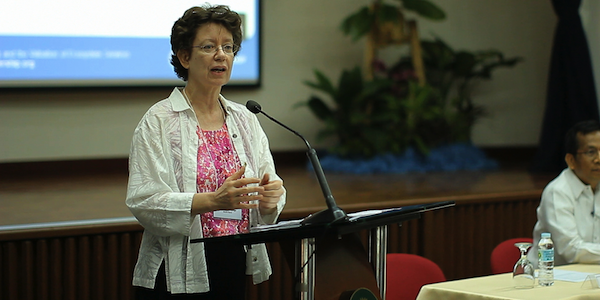 Learning from each other is important for capacity building and institutionalization,” added Lange. Secretary Arsenio Balisacan at the opening ceremony of the five-day workshop. The opening ceremony was led by Arsenio Balisacan, Secretary of Socio-Economic Planning and Director General of the National Economic and Development Authority (NEDA), the Philippine Government’s economic planning agency and lead agency for WAVES in the Philippines. “Global sustainable development has been a catchphrase since the Rio20+ conference. To have economic prosperity in parallel with social cohesion and environmental protection is a state of development we all aspire for,” Secretary Balisacan told the workshop delegates. “Our natural environment may seem to provide free and unlimited services due to its capacity to regenerate. However, this may no longer hold true in the coming decades due to increasing environmental trade-offs,” Balisacan added. The Philippines is pioneering the development of ecosystem accounts and has been seen as an example by other emerging countries in mainstreaming environmental accounting in economic planning and policy making. WAVES-Philippines includes two pilot sites: the Laguna Lake Basin, which will study pollution and sedimentation of the lake ecosystem, and Southern Palawan, which will focus on the competing land uses of this biodiverse rich area. The countries that were in attendance are all low to middle-income countries, where competing demands on natural resource use steadily intensify as their economies grow. They included all the WAVES' core implementing countries: Botswana, Colombia, Costa Rica, Guatemala, Indonesia, Madagascar, the Philippines, and Rwanda. Representatives from India also joined. They are looking at ecosystem accounting as a way of making well-informed development plans at the local level that will ensure that growth is more sustainable over the long run. The first two days of the workshop were dedicated to training delivered by international experts from a host of institutions including the Australian Bureau of Statistics, Australian National University, University of Wageningen, the United States Geological Survey, and the WAVES Secretariat. 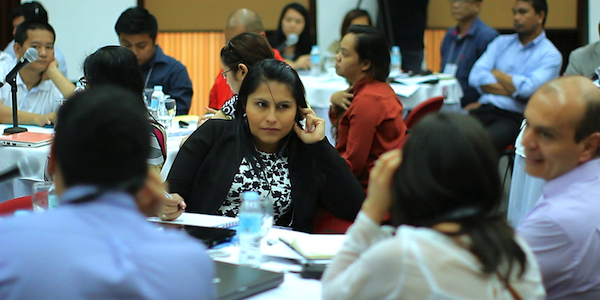 Most of the training was interactive, encouraging participants to share their understanding and experiences. This was complemented by a field trip to the Laguna Lake Basin to see and understand the dynamics of a real ecosystem and how accounts will help manage the resource better. Neric Acosta, General Manager of the Laguna Lake Development Authority (LLDA) and Philippine Presidential Adviser for Environmental Protection, led the tour of the Laguna Lake Basin explaining its importance as an ecological resource to the Philippine capital of Manila and its immediate surrounding provinces. Countries with advanced experience of ecosystem accounts, the Philippines (Laguna Lake and Southern Palawan), India and Guatemala, shared their experiences in ecosystem accounting. On the final day, the countries developed work plans for the next 12 months, outlining the status of ecosystem accounting in their country and their next milestones. In terms of best practices, all groups agreed on the importance of gathering a diverse cross-section of stakeholders to involve policymakers and influencers across all levels and sectors. Initiating data sharing protocols was another key factor identified to help mainstream environmental accounting. Ensuring needed budgets and resources for institutionalization is the third critical challenge that needs to be addressed. At the closing ceremony, Romeo Recide, Interim Deputy National Statistician of the Philippine Statistics Authority (PSA), spoke about the future of environmental accounting in the Philippines. “If proven successful and sustainable, environmental statistics can become designated statistics, the kind of statistics that is required. Becoming designated statistics means getting budget and other resources needed to institutionalize environmental accounting,” said Recide. Hector Tuy, Human Ecology Research Associate and Guatemala representative, presented Recide with publications of their environmental accounts. “We were inspired by an executive order the Philippines passed in 1997 which tried to institutionalize environmental and ecosystem accounting in the country. 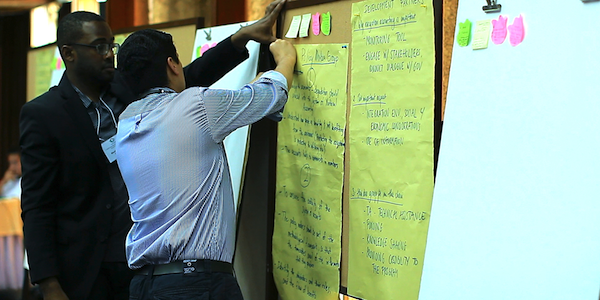 This inspired us to begin our own ecosystem accounting in Guatemala,” said Tuy. An online platform has been established to continue the exchange of shared experiences and build on the knowledge of each country as they progress with the development of their ecosystem accounts.